Creating “one-off” custom instruments has always been problematic for companies designed to manufacture in any sort of quantity. In a factory environment, where costs are based on producing large numbers of identical instruments, building a one-off presents a particular challenge. The largest modern manufacturers address the issue by creating “custom shop” departments that do not directly affect labor costs on the main production lines. Restricting the number of workers in these divisions helps control expenses, but they nonetheless operate on a bubble because overhead is measured directly against the amount of goodwill they produce. In the 20th century, large manufacturers typically solved these issues by creating custom instruments based on existing models, often with simple modifications like finish, change in trim level or other minor alterations. 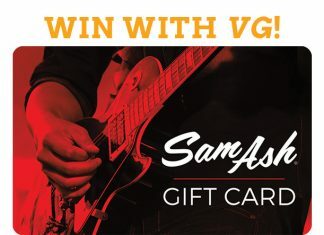 Gibson, in particular, has a long history of building unique instruments for musicians. Insight can be gained from a 1940 letter written by Gibson employee Julius Bellson in answering a request for a special L-12 with a blond finish. Clearly, the policy did not remain in effect, as Gibson continued to build one-offs after 1940, but it does demonstrate the struggle between the company’s accounting and public relations departments! The Ganus family, of Birmingham, Alabama, was involved in gospel and country music. In the ’20s, brothers Walter, Stancel, and Alva Floyd Ganus (along with another member) sang in the Birmingham area as the Ganus Brothers Quartette. Walter was part-owner of the A.J. Showalter Company, then in 1914 started his own music publishing company. In ’28, a younger Ganus Quartet came along made up of four of Walter’s sons – Claude, Clyde, Clarence, and Cecil. Each was proficient with several instruments, and they toured as performers while also conducting singing schools throughout the southeast, instructing vocal and instrumental skills. Their concerts included vocal, instrumental, and comedy songs. The L-3 Special built for the Ganus Brothers is a good example of a custom instrument created in a mass-production environment by making basic changes. The factory order number indicates it was ordered in October of 1930 and the serial number shows it shipped in November. While this may seem like quick turnaround, there are other documented examples of pre-war custom Gibsons created in the same time-frame. One advantage of limiting custom work to simple modifications of existing models is that it can be accomplished quickly. 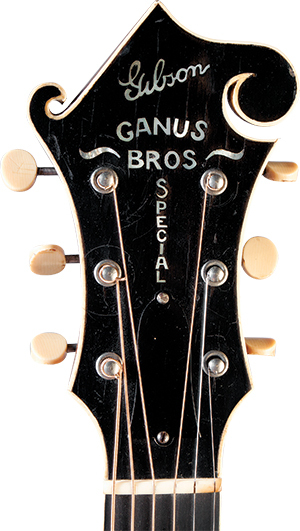 Some of the simple variations in the Ganus Brothers L-3 include star-shaped mother-of-pearl fingerboard inlays (rather than dots) and an oversize Florentine-style peghead shape with inlaid script pearl Gibson logo and “Ganus Bros Special” in pearl. The altered peghead shape was created from a template for the K-4 and K-5 mando-cello and the mother-of-pearl inlays required only a call to Gibson’s pearl subcontractor, Aumann Brothers, in Detroit. The only real customization was a modification of the body depth to 41/2″. 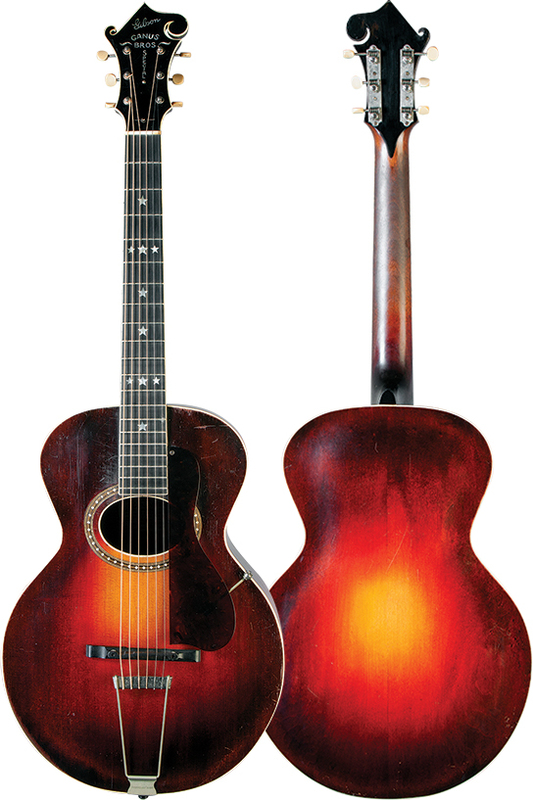 In other respects, the instrument conforms to model specs of the period, with a 131/2″ body, carved spruce top with oval soundhole, birch back and sides, mahogany neck, ebony fingerboard, and adjustable-height bridge, elevated tortoiseshell-grain pickguard, trapeze tailpiece, three-on-a-strip tuners, and nickel-plated hardware. Typical of an L-3, it has a hand-rubbed sunburst stain finish on the top, but unlike the standard uniform red-mahogany stain on the back and sides, the Ganus Brothers Special has sunburst finish on the back and sides. Overall the guitar is in fine structural and cosmetic condition after surviving almost nine decades of use. The scroll on the treble side of the peghead has been re-glued – a common repair on Gibsons with the Florentine scroll peghead. The back seam at the end block has also been re-glued. Gibson records show another L-3 Special – with a serial number consecutive to this one. The instrument was returned to the factory for repair and on May 13, 1936, was shipped back to Mr. H. Baird c/o E.E. Forbes & Son Piano Company of Birmingham, Alabama, in a #410 case. While its whereabouts are unknown, it suggests the Ganus Brothers ordered more than one, or that Gibson required more than one be built, as a cost-cutting measure. Whichever the case, at least one more “Ganus Brothers Special L-3” may be out there.